AP BAS Best Available Schools 5th Class Entrance Test 2018, AP Best Available Schools BAS 5th Class Entrance Test 2018. 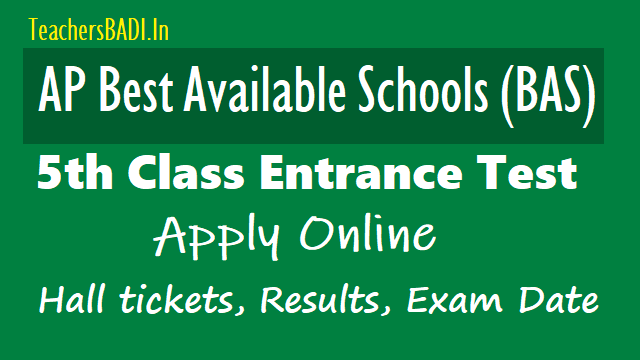 AP Best Available Schools (BAS) Admissions Online Application 2018-19 for AP Best Available school scheme Admissions.AP BASS Admissions: AP Best Available School Scheme admission notification 2018: AP Best Available School Scheme Admissions notification 2018, AP Best Available School Scheme Selection notification 2018, AP BASS admission test, AP BAS entrance test would be conducted for this year: Tribal Welfare Department/Social Welfare Department would give the BASS Admissions 2018 notification in every year in March/April month for admission into 1st, 3rd, 5th, 8th classes for the academic year 2018-2019 and invites Online applications from the eligible students for admission into 1st, 3rd, 5th, 8th classes under #BASS. AP Best Available Schools (BAS) 5th Class Entrance Test 2018 and AP Best Available Schools (BAS) 1st Class Admissions: Now, AP Social Welfare Department has given the BAS Notification for selection of Schools under Best Available School Scheme for admissions into 1st and 5th Class only. Admit the 1st class student through Lottery system and in respect of 5th class student through written exam only.